We had a beautiful morning for our paint-out at Alhambra Park. It's an old park that I've driven by for many years. One thing that has always caught my eye is the swimming pool which can be seen while driving past. The park is hilly and the pool is on top of a hill. It usually looks lovely and blue, but sometimes it's empty. I had decided to try painting the pool before I arrived at the park and fortunately it was filled. It wasn't until after I had finished my painting and walked over to where my friends were still finishing up that I saw a street vendor. The man was circling the park with his push cart, selling ice creams and paletas. The paleta man would have been a nice addition to my watercolor. Next time! I was looking forward to the paint-out at the Crossroads of the World on Sunset Blvd. in Hollywood. In the 1980s when I was doing free-lance artwork, illustrating a line of greeting cards, one of the companies I worked with had their offices at the Crossroads of the World. I hadn't been back to the location for quite a few years. 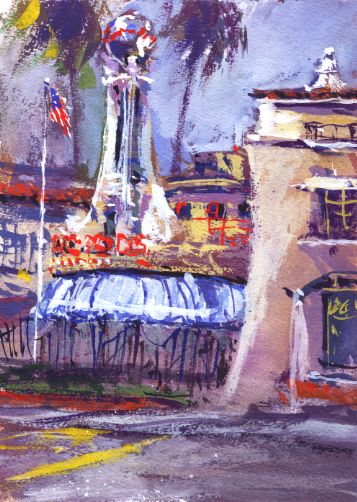 There is a central building made to resemble an ocean liner which is where I used to deliver my finished watercolors. The stunning complex was built in 1936 and had retail shops in the surrounding cottage style bungalows. Now those bungalows are private offices for entertainment industry companies. Of course it's a location that has appeared in several movies. What a spectacular place to try a plein air painting! The street entrance features a striking tower and spinning globe. Well, it turned out that plein air painters needed advance reservations to paint there. Okay, that news didn't stop us. We went across the street and painted from the sidewalk. It was a better view anyway. I only had time to paint a small gouache. I tried to capture the red, white and blue feeling of the landmark complex. Hollywood is always exciting and our paint-out was no exception. A view of the central ocean liner building from the back. Some artists in our group painted the other artists! 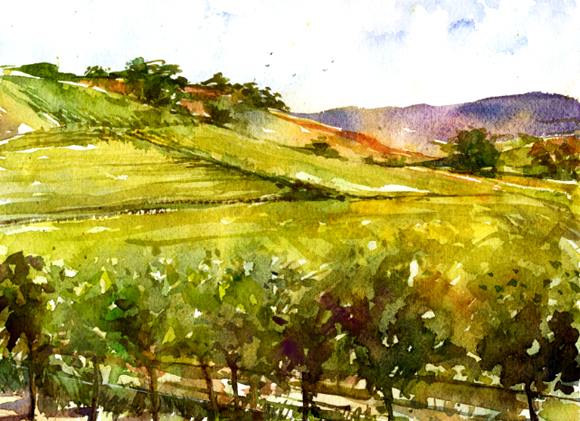 I'm not sure why I love plein air painting so much. It felt like a perfect fit when I finally found out about a local paint-out group. 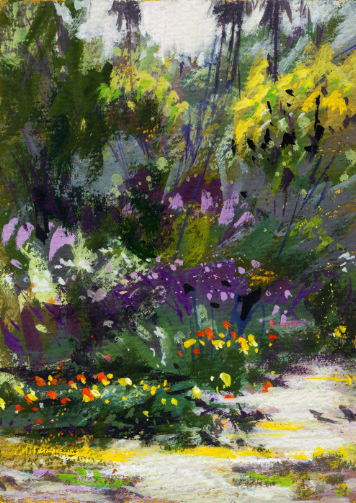 The Virtual Paintout, while not a "real-life" paint-out, is something I've really enjoyed participating in. Bill Guffey created it several years ago. He chooses the location for the month and artists find their view to paint using Google Street View. It's all explained on his blog along with a list of previous locations which can be anywhere in the world where those Google cameras have been. The drawings or paintings for the month are submitted to Bill and he generously posts them all on his blog and on Facebook. The location for April 2013 was Bulgaria. I'm pretty sure I won't be seeing Bulgaria in person so it was fun as always to look around, virtually. 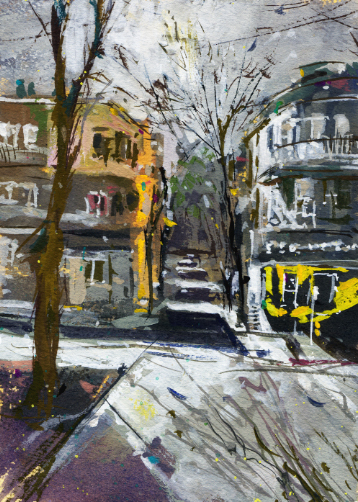 I started looking around the city of Varna and found some wonderful views I thought would be fun to paint. 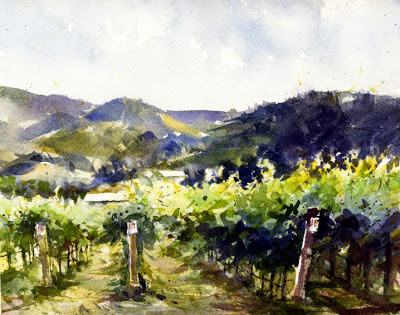 Then as the end of the month approached I realized I had signed up for the two-day workshop given by Fealing Lin and hadn't done my Virtual Paintout piece. I kind of ran out of time and could only finish one gouache piece. But I like the way it turned out, so that's a plus! I know, it doesn't sound like a fabulous title for an art blog. But one of the things I love about the Saturday paint-out group is the variety of painting locations and a recent one was definitely "industrial decay". 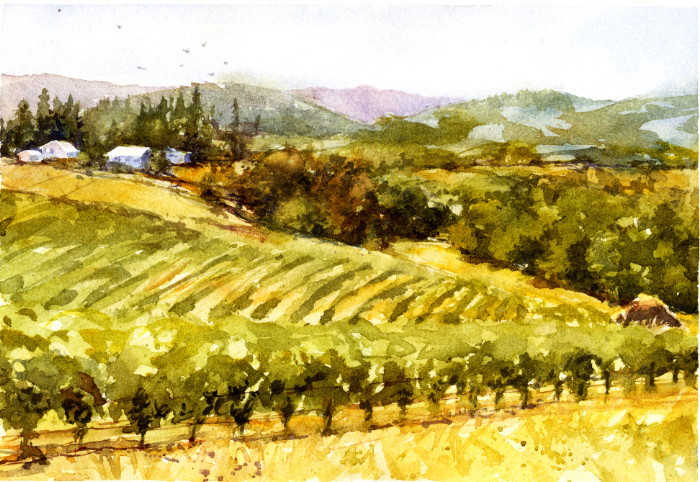 The group's organizer is a wonderful like-minded artist, Barbara Field. Since I found out about the group last year we've been to quite a few unusual, maybe even offbeat places to paint. A terrific thing! A few weeks ago we had Industrial Decay in Alhambra as the location. This was something I thought would be interesting to paint. Behind a very busy street lined with chain stores, is an old area of huge warehouses and structures used for metal working and fabricating. The buildings and hangars are deserted now and beautifully rusty. I had been taking photos through the chain link fences of the old, crumbling structures. But the day we met to paint, there was a DEMO notice on the fence. The fence had a new liner so it was hard to see the buildings and the demolition had already started. We heard a new mall is going in the space. We'll see. 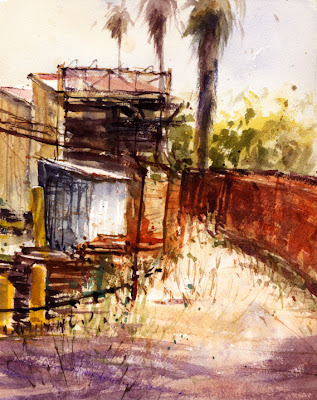 At one end of the block Alhambra Foundry is still in business and I found a view to paint there. They've been fabricating steel and making manhole covers since 1923. Another exciting location! 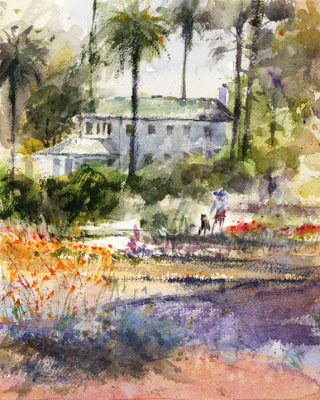 It's Mother's Day and Arlington Garden in Pasadena would be a lovely place to visit today. But, we're having a heat wave in May so another day would be better to see the garden. 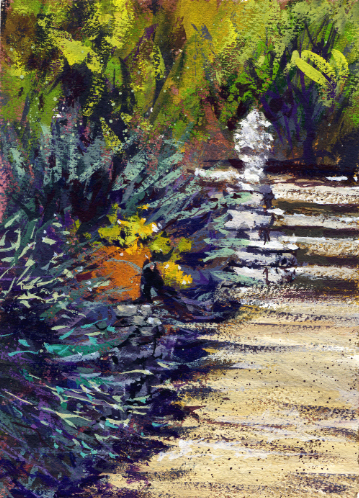 The last time I was at the garden was with one of the plein air paint-out groups and I'll share the two pieces I painted that day in April, as well as two fun photos. The garden was so full of spring flowers last month that painters were there just about every day. 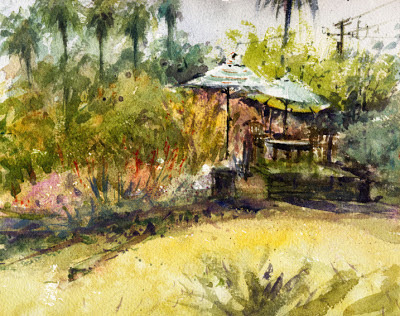 I painted an 8x10" watercolor looking east across the garden. I also brought along my gouache for a 5x7" piece. 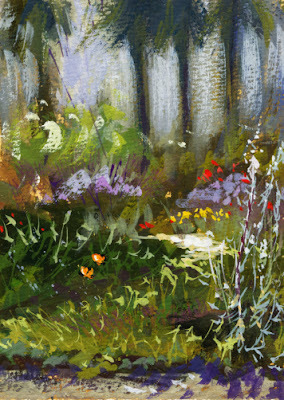 On my previous paint-out there with my artist friend Barbara, we noticed many monarch butterflies. I posted that painting last month in Saturday In The Park. The monarchs are special since Barbara grows milkweed in her yard for the butterflies, and we wondered if the ones we saw might be from her garden which isn't too far away. I saw so many monarchs flying by as I painted the pieces below that I had to include two in the gouache piece. I hope they read as butterflies and not poppies! A wonderful water wand fountain, or garden sculpture. I don't know if it's functional. This egret didn't seem to mind artists in her garden. She was after the many lizards there. 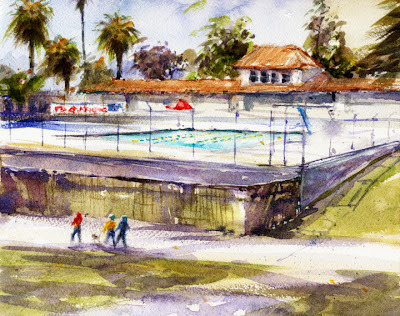 Arlington Garden is a very special place, a new Pasadena landmark. It's Pasadena's only dedicated public garden, not a park or playground. Arlington Garden is unique, no other place like it in other San Gabriel Valley cities. There are paths through various garden areas, tables and benches, and even a labyrinth. There are surprises around every corner. It's also a demonstration garden for water-wise plantings. This small garden is a favorite of artists and photographers. With the beautiful wild flowers blooming this spring, the plein air groups I'm in have met there several times. There is always something for me to paint of course. Finding some shade is a challenge. I still need to find an umbrella. I've blogged about previous visits and paintings in two posts Saturday Paint-Out and Saturday In The Park. This 8x10" watercolor went pretty well. I'm also posting two gouache pieces, 5x7". The garden is perfect for painting and relaxing! I recently enjoyed a challenging and fun two day workshop given by Fealing Lin. The workshop was held at the National Watercolor Society's wonderful new headquarters in San Pedro, CA. 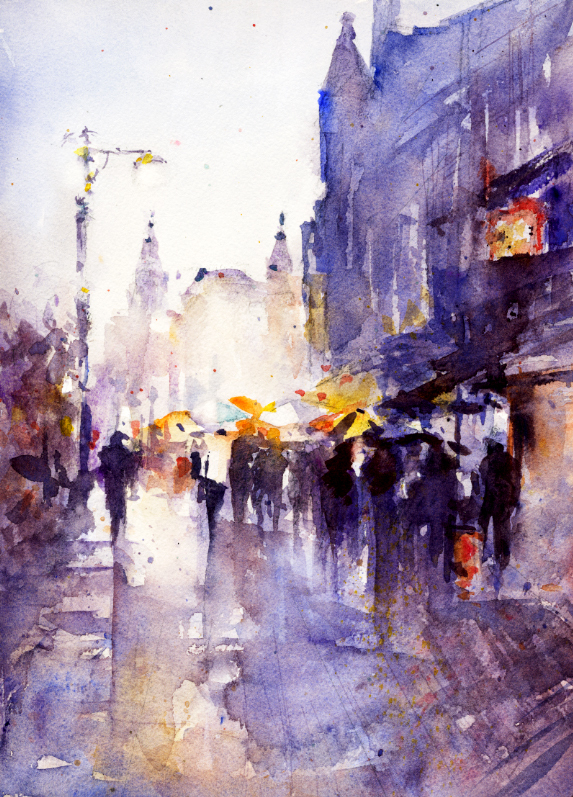 The focus of this workshop was Landscapes and Cityscapes. 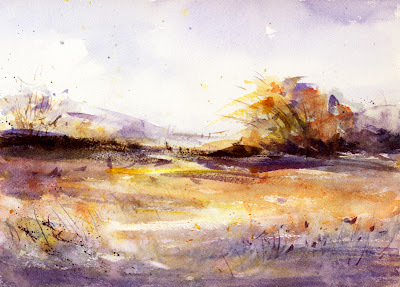 I've met so many watercolor artists who have been students of Fealing Lin that I really wanted to finally meet her. Fealing Lin is well known for her portraits but I also love her landscapes and street scenes so I was looking forward to the class for months. Fealing is such a lovely person and also an excellent, instructive teacher. It's always so helpful to watch accomplished watercolor artists as they work. Fealing painted a scene and then we tried a painting from the same reference. It's fun to see how each of our pieces turned out so differently when we all used the same reference photo. I finished two landscapes, a cityscape, and started a fourth piece from one of my own photos. The workshop camaraderie among the artists is of course one of the best parts. I just love workshops!